In Nova Scotia, purple benches located in public places serve a dual role—they honor the memory of women who were murdered by their partners and they provide information so that people facing domestic violence know where to turn for help. Known as Barb’s Benches, the colorful memorials were launched to help keep alive the memory of Barbara Baillie who was killed by her husband on Oct. 19, 1990. As the 25th anniversary of her murder approached, her five children wanted to do something in her honor. Her husband began to be physically violent started around the time he turned 40. Dobbin was already married and out of the house, but her four teenaged brothers still lived with their parents. “My father started to feel old and unattractive and he thought my mother was having affairs. He became more controlling. He wouldn’t leave her alone. They had always had a lot of friends, but he distanced himself and her from everybody except us kids and my husband,” Dobbin says. In May 1988 Baillie’s husband assaulted her, breaking her cheekbone. After that incident Baillie left a note in Dobbin’s bathroom for her to find—scrawled with a makeup pencil on a piece of toilet paper, she asked for help—and family members immediately arranged for her to go live with her sister in Cape Breton. But her abusive husband promised he would get counseling and she came back. “There was no counseling, and his abuse got worse. After that she could not even go to the bathroom by herself,” Dobbin says, because her father wanted to make sure she didn’t try to leave another note for help. Baillie sought help at her church and at two local shelters. “But she kept going back. My father would tell her things would change, and she would think things would get better. She loved him, and she wanted my brothers to have a father,” Dobbin says. Baillie’s husband told her and all five of their children that if Baillie tried to leave he would kill her mother, her sister, and the oldest of the four brothers. After that, Baillie stopped trying to leave. Still, Dobbin considers her mother a hero. “I really believe she knew her days were numbered and she stayed because she figured she’d be saving everyone else,” Dobbin says. The basement door was locked, so Dobbin’s brother, who had been upstairs, climbed through the basement window and unlocked the door for her. When they turned the lights on they saw their mother. “My father had her laying in this pile of dirty laundry with a rope around her neck. That’s the last time I ever saw my mother,” Dobbin says. They attempted CPR and Baillie was rushed to the hospital. It was too late. A SWAT team soon captured Baillie’s husband. He was charged with first-degree murder, pled guilty to second-degree murder, and spent 18 years in jail. He returned to Spryfield in Halifax, where Dobbin and her brothers still live and occasionally run into him. In fall 2015 Dobbin and her brothers were talking about remembering her mother. “We didn’t want her forgotten. We were coming up on the 25th anniversary of her death, and we thought it would be really nice if we could have some type of memorial here in Spryfield,” she says. They thought maybe they could plant a lilac bush at a park or at her church. Dobbin reached out to Brendan Maguire, a member of the legislative assembly, and he suggested placing a bench in the park at Long Lake. The bench is purple—the color associated worldwide with the domestic violence awareness movement—and a plaque on it honors Barb. It was unveiled in a ceremony on Oct. 19, 2015, the anniversary of Barb’s death. Now, the Barb’s Benches program is expanding. “Brendan took the idea a step further and went to the House of Parliament,” Dobbin says. He secured funding for a total of four benches to be placed in Nova Scotia over the next two years. “When the fourth one is done we’ll go back and say, ‘Okay, we need 104 more,” Mosher says. She hopes to see more benches placed in the future to bring more awareness to domestic violence. “Domestic abuse is real. Real people lose their lives because of it,” she says. In Canada and the United States, other organizations have found creative ways to partner the color purple with various objects to help raise awareness of domestic violence. New York City has illuminated the Empire State Building purple in October, and Niagara Falls has been awash in purple lights as well. And communities in Canada, the U.S. and Guam have hosted purple light nights. 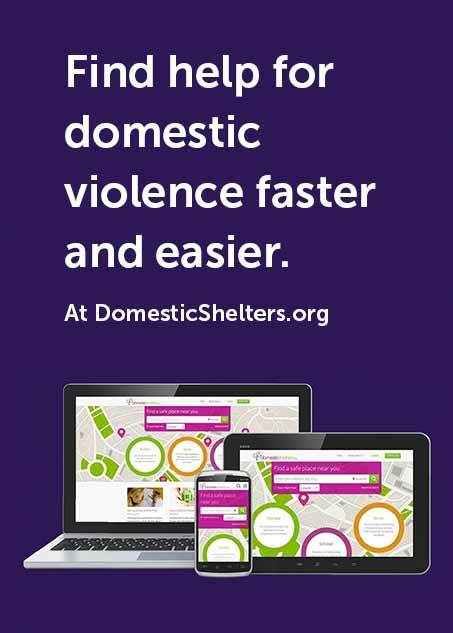 In 1995 President Bill Clinton proclaimed October National Domestic Violence Awareness Month in the U.S.
How Many Homeless People are Fleeing Domestic Violence?